Director Alexander Payne’s Downsizing isn’t the first film to tackle the concept of physical reduction. Of course, the Rick Moranis fanatics among us – yes, you know who you are – remember Joe Johnston’s Honey, I Shrunk The Kids, a film that, for its time, was visually innovative, admittedly silly but wholly heartfelt and effectively entertaining. Payne has taken a different approach with Downsizing: while it still reaches for a lighter touch, it surrounds that grasp with some heavy subject matter, dealing in political exile, issues of social exclusion and the looming stench of the lure of capitalism. Now, Payne is certainly ambitious with his vision here. Downsizing features all of the impressive production design of Johnston’s adventure film, whilst broadening its ethical horizons in order to commentate on the relevant concerns mentioned above. However, all of these ideas feel like sporadic ingredients thrown into a large casserole pot: while Payne was planning on a recipe for success, he instead invented a conflicted dish that might leave your mouth tasting a little sour. It’s difficult, therefore, to record a synopsis for the film because it doesn’t settle into a tonally harmonious rhythm. 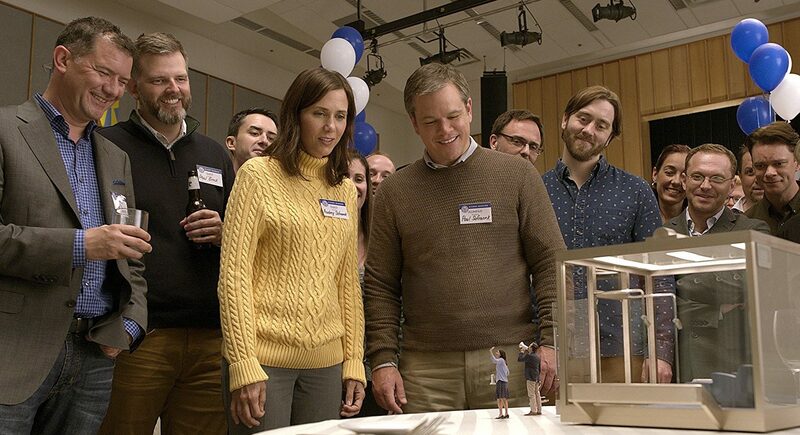 While Downsizing starts as a scientific drama that probes the possibility of size reduction as a solution to over-population, it unexpectedly mutates into a mid-life crisis comedy presented through the lens of psychedelia, dabbling in a Doomsday sub-plot that is handled with laughable blatancy. It’s a confounding narrative structure that fails to live up to the potential of its premise. I can understand that many critics are appealing to the masses to appreciate the wider aspirations of Payne’s film. But, with a limited spell of two hours to cover the many properties of the human condition, it’s just simply too much. There are brief flourishes of satirical genius that fail to bloom into anything fruitful: as an example, several scenes establish a hilariously virile paranoia in the protagonist, Paul (Matt Damon), only to abandon it as he submits to a cinematically timeworn yearning for unity and solidarity. Moreover, Payne takes it upon himself to contribute to a number of debates that feel rudimentary in register and inappropriate in implementation. With the introduction of fictional Vietnamese activist Ngoc Lan Tran (Hong Chau), a character that is downsized against her will for rebelling against her government, Payne seems to be performing some activism of his own. However, he should have taken a few pages out of Angelina Jolie’s book on political critique. With her phenomenal film First They Killed My Father, adapted from the memoirs of a victim of the Khmer Rouge Regime, Jolie directs the story with a delicate humanist touch: she makes no grandstanding claims of her own, allowing the people who populate her film to do the talking. Payne makes the fatal mistake of taking a personal jab at the subject, delivering a sluggish diatribe in the form of a news report. It’s a disappointing outcome from a director who has built his name on sensitive subtlety. As I have mentioned already, the technical audacity of Downsizing cannot be overlooked. Payne has painstakingly recreated a reformed world in miniature, reimagining objects that we take for granted, but on a scale that is alien to us: the sight of Damon lugging the bud of a rose down a corridor is indicative of the unusual yet intriguing success of Downsizing’s visual aesthetic. 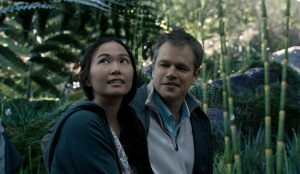 Furthermore, irrespective of the ineffective use of her character, Hong Chau’s performance is an admirable debut: she balances an emotional core with humorous undertones that contribute to her likeable presence, leading us to desire a larger role for her amidst a cast of underwritten caricatures played by the likes of Kristen Wiig and Christoph Waltz. It’s just a shame that these positives are offset by some ineffective social observations that disable the quirky promise of its conceptual foundation. What should have been an experience that encouraged intellectual growth, alternatively stimulates a shrivelling relationship to the action on screen. May I recommend that you don’t choose the option to downsize?